We drove for about an hour this morning to get to Rotokare Scenic Reserve. There was quite thick fog on the way and I wondered if we would see anything once we got there! But we drove through the worst of it and was able to see Rotokare in all its splendour. We had the final field trip web conference in the education room at Rotokare. You can see what the room looks like with this 3D image Duane uploaded to the Google Street View app – view image here. We had three experts on the web conference this morning. Duane Wilkins, Jenny Kerrisk, and Fiona Gordon. Our speaking school was Karori Normal School. I have enjoyed all the web conferences this week. Remember you can listen and watch a recording of them any time via the links in the timetable on the Web Conferences page. When you drive into Rotokare Scenic Reserve you know you are in a special place. You can hear all the birdsong as soon as you enter through the predator proof fence. The fence goes right around the entire reserve. It is a great example of a conservation project that has had success. But as Reserve Manager Simon Collins says, it’s not just the fence which has helped them to achieve so much. One of the key parts to the success of this conservation project is the people who help make it happen. Watch the video and hear Simon’s encouraging words for getting involved in your own conservation project. We had a special activity planned for the morning with students from Devon Intermediate and the Tiki Toa group. 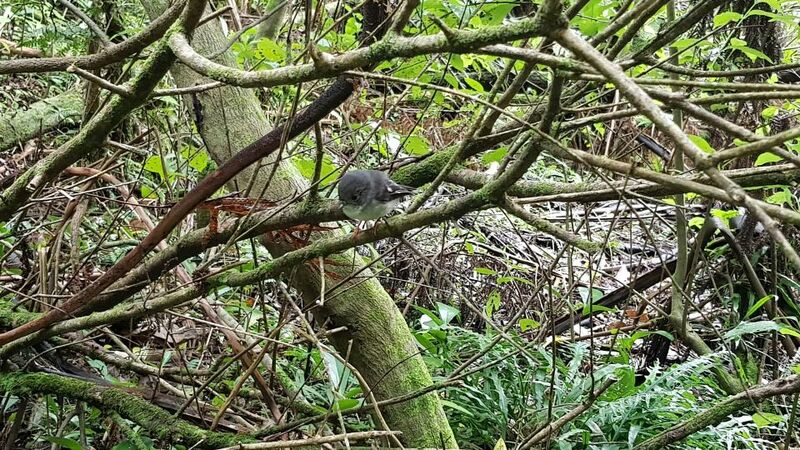 Site Manager at the Reserve, Fiona, took us on a hīkoi to find a young female kiwi. The kiwi was due to have the transmitter on its leg changed. This transmitter is a device which sends out a signal. The team use aerials and receivers which pick up the signals. As they get closer to the transmitter, the radio receiver gives loud beeps. This enables the team to locate the kiwi. 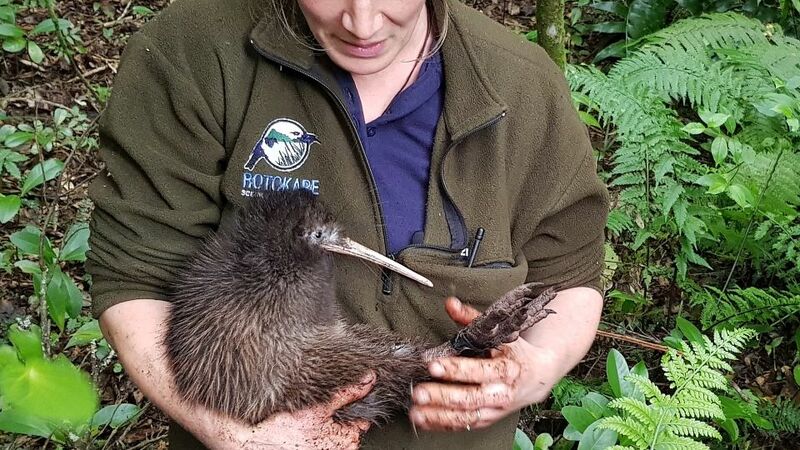 It took a while for Fiona and the team to get the kiwi out of its burrow. But in the end, they managed to get hold of her. We watched Fiona change the transmitter. She also gave it a health check and took some measurements to see how much the kiwi had grown. Fiona then took her back to its burrow. The kiwi could now get back to sleep! 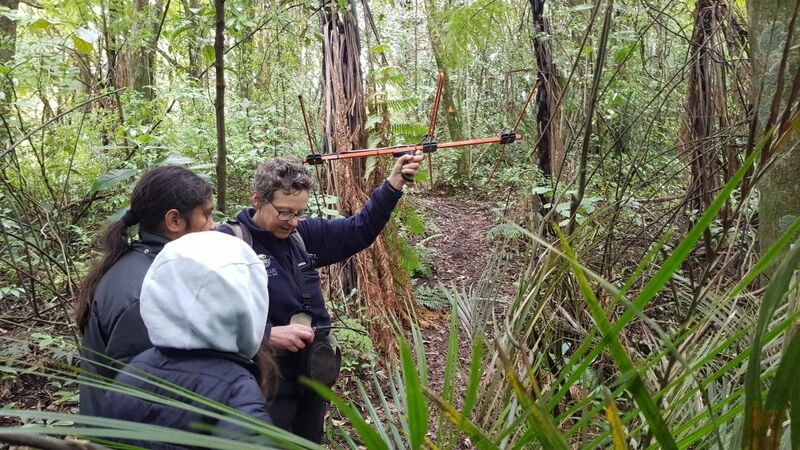 If you are interested in finding out more about location and mapping technology for kiwi conservation, have a look at some of the LEARNZ Kiwi field trips (click on “kiwi” under Learning Areas on the Field Trip Chooser page. There are videos where you see the aerial and radio receiver in action. 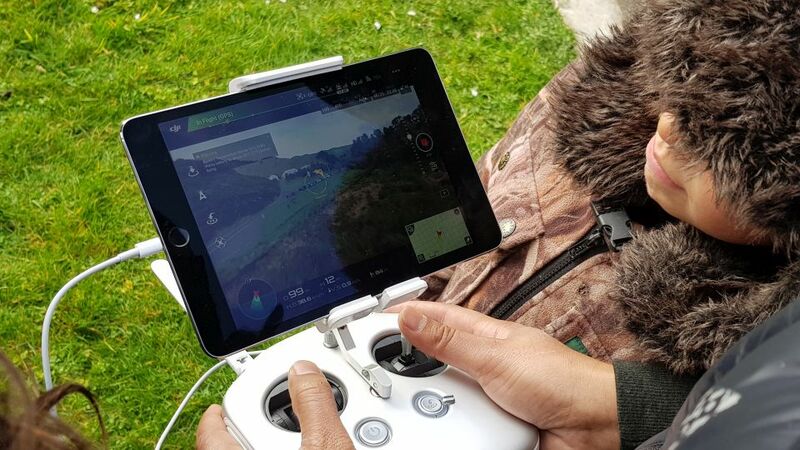 You can also find out more about mapping locations of kiwi with a device that picks up their transmitter signals from the air. Back in Rotokare’s education room, Duane showed us how to do a maths activity using Google MyMaps. 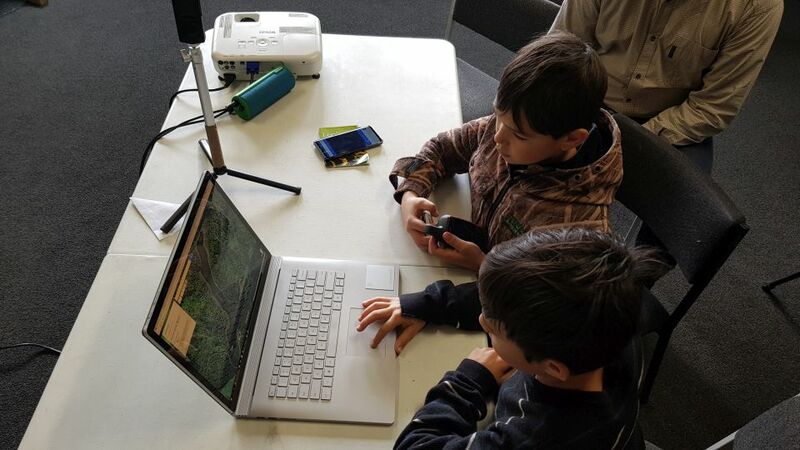 In the activity we were able to use software within Google MyMaps to calculate the area of Lake Rotokare. This is an application that I’m sure you will find many uses for. You can see our example from today on the videos page, and there is also an instructional video on how to do it yourself. Measuring with MyMaps instructional video. I hope that this week’s field trip has given you an opportunity to see how digital mapping technology can assist with learning about and sharing the places, people, and projects that are significant to you and your community. I’m sure there are lots of ideas you now have that could be the focus for your own mapping project. Karawhiua! 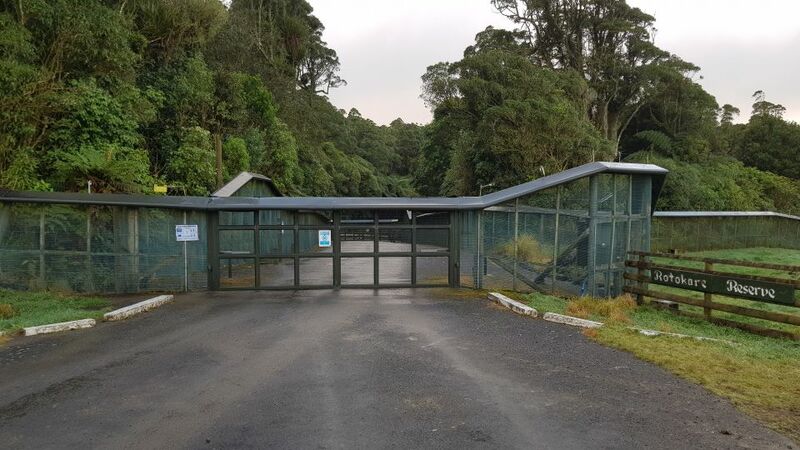 The entrance to Rotokare Scenic Reserve. There are two gates to go through when you enter through the predator proof fence. Why do you think there are two gates? Image: LEARNZ. 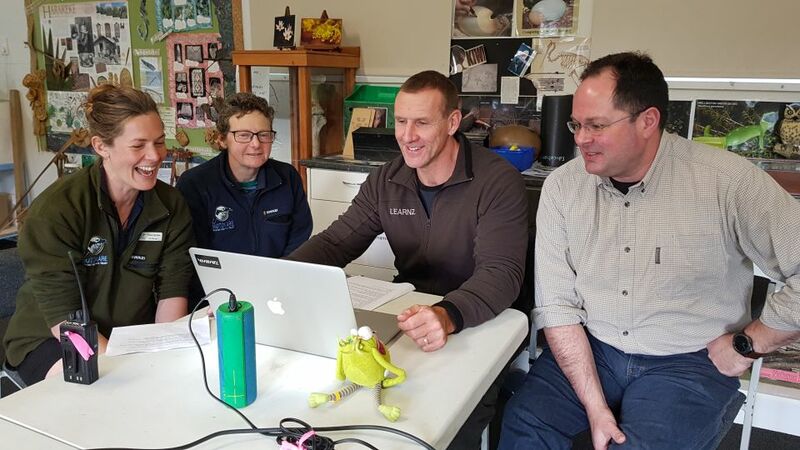 Andrew and Egbert with this morning's web conference experts in the education room at Rotokare Scenic reserve. Image: LEARNZ. 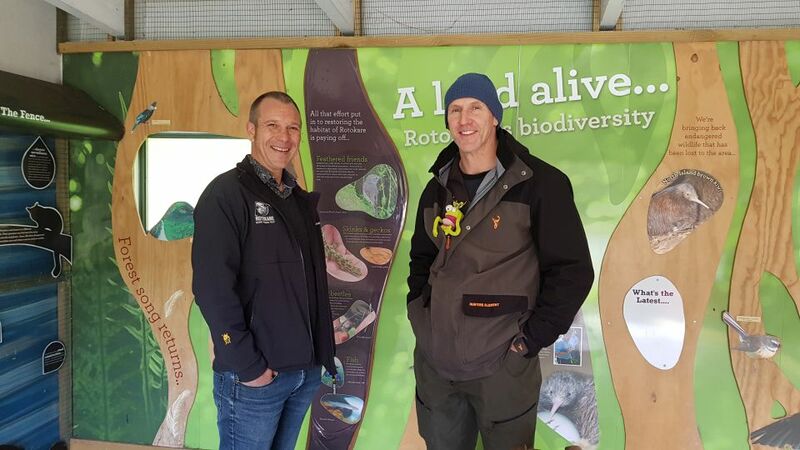 Andrew and Egbert with Rotokare Sanctuary Manager Simon Collins. Image: LEARNZ. 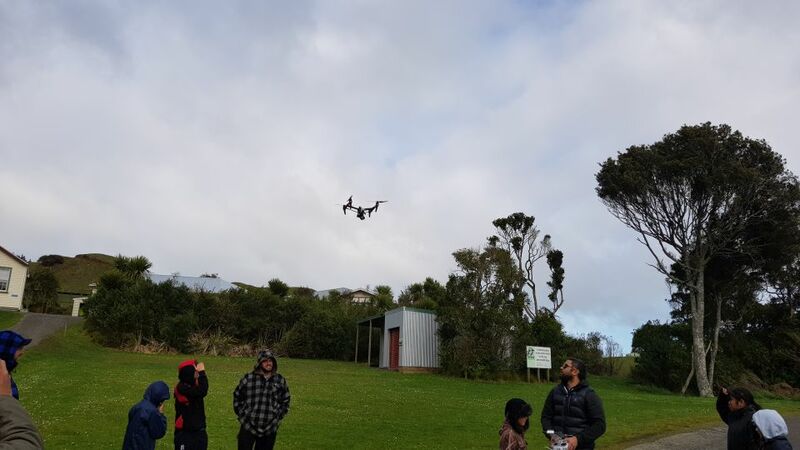 We had a drone at Rotokare today. You’ll see some of the footage taken with it in today’s videos. Image: LEARNZ. I wonder how drones are being used for mapping? Image: LEARNZ. Jenny Kerrisk shows the students how an aerial and receiver is used to pick up signals from the kiwi’s transmitter. Image: LEARNZ. A little tomtit/miromiro looking for its lunch at Rotokare. Image: LEARNZ. 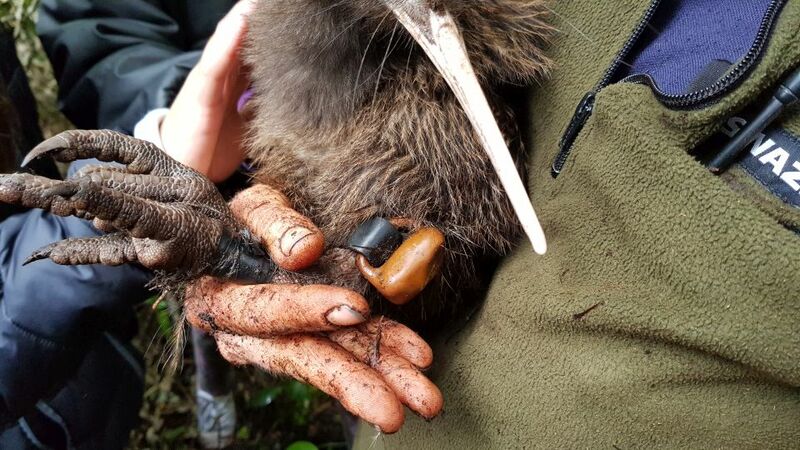 Fiona holds the kiwi which was located using transmitter tracking technology. Image: LEARNZ. Here you can see the transmitter on the kiwi’s leg. Image: LEARNZ. Learning how to use MyMaps for area measurement back at Rotokare’s education centre. How might you use this mapping maths technology? Image: LEARNZ.